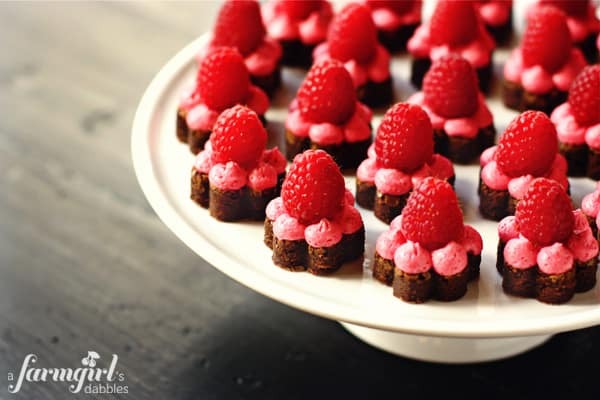 When I originally shared my Fudgy Brownie Hearts with Fresh Raspberry Buttercream before Valentine’s Day, I really had no idea how much I would crave that exact combination of flavors afterward, or how easy it would be to adapt the recipe for different seasons and holidays. I was recently looking for a small pretty dessert, befitting a spring brunch menu. When nothing was jumping out at me, I decided to reincarnate that chocolate and raspberry treat I fell in love with a couple months ago. 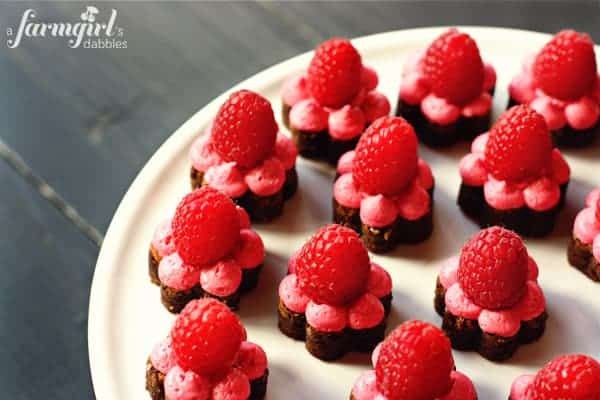 These Fudgy Spring Brownie Bites with Fresh Raspberry Buttercream are much smaller in form, only slightly wider than the large raspberry at the center…perfect for a spring dessert buffet (so you can try each and every sweet treat available! ), baby or bridal shower, or Mother’s Day brunch. A little flower shape of deep dark fudgy brownie with some beautiful raspberry buttercream (its raspberry flavor AND color come from fresh raspberries alone, no artificial enhancements! ), crowned with a juicy red berry…heavenly! Stir the butter and chocolate in a large heavy saucepan over very low heat until chocolate is melted. Remove from heat and whisk in the sugar, and then the eggs, 1 at a time. Whisk in espresso powder, vanilla, and salt. Then sift the flour over the chocolate mixture and stir to blend well. Transfer batter to prepared pan and bake brownies until slightly puffed and dry-looking, and tester inserted into center comes out with some moist batter attached. This should take about 20 minutes. Let cool completely in pan on rack. Once cooled, run a knife around the inside edge of the brownie pan. Use the overhanging foil as an aid and gently lift the brownies from the pan. The pan I used produces a brownie that is 1/2″ thick. Be sure your cookie cutter is taller than 1/2″. Press small flower-shaped cookie cutters (the cookie cutter I used measures 1-1/2” in diameter, a piece from this set) firmly into the cooled brownie. Use a thin metal spatula to lift the cookie cutter filled with brownie from the foil. Gently press the brownie out of the cookie cutter. Repeat the cutting process until your brownie looks like a big piece of swiss cheese, and you have a whole bunch of little brownie flowers. Cook the raspberries in a medium saucepan over medium heat, stirring frequently until the raspberries are broken down into a sauce. Set up a fine mesh strainer lined with 2 layers of cheese cloth. Pour the raspberry sauce over the cheese cloth to remove the seeds. I gather up the ends of the cheese cloth and gently press out all the raspberry juice. Pour the raspberry juice back in the pot. Simmer until the juice reduces to a 1/4 cup. It will be a very rich red and concentrated sauce. Set aside to cool completely. With a mixer, cream the butter with a paddle attachment on medium high speed about 2 minutes, until lightened in color and a bit fluffy. Add 2 cups of powdered sugar, the 1/4 cup of cooled raspberry sauce, lemon juice, and salt. Mix until smooth. Add another 1-1/2 cups of powdered sugar and mix until smooth. If you want the frosting less stiff, add some milk, 1 tablespoon at a time. I did not add any milk to mine, and thought it was perfect for piping. Fit a pastry bag with a medium-large round tip (I used a Wilton #12) and pipe the frosting onto your cut-out brownie flower, in little dollops. 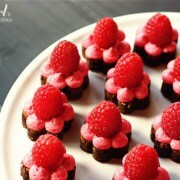 Finish by placing a fresh raspberry in the center. Fresh Raspberry Buttercream recipe adapted from Making Life Delicious.